From "The Prima Donna" in the "Kayo-chan Series"
". . . oh. . . no!" Hida became a beautiful ballerina in an instant. As soon as Hida heard the bell ring, he was forced to straighten his back, stand on tiptoe and tilt his neck upward. ". . . oh no! . . . m- my body. . . h- has its own will!" He could not control his body at all. The ballerina began to move on tiptoe. The next moment, Shimazaki, playing the part of the prince, came very close to him. "Come on. I can't do that with you. . . but my body is doing it. . . against my will. Ahhh!" The two of them rushed out onto the stage. The prima donna performed her jump with no flaws and the sturdy prince received her firmly. 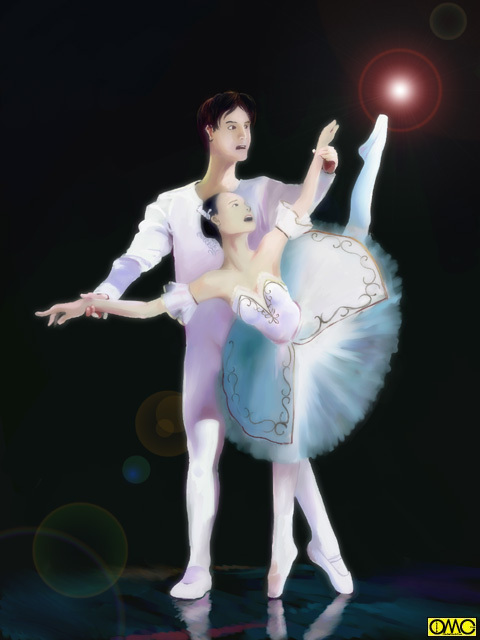 From time to time, the beautiful ballerina was held in his hands and then moved away to keep on dancing. They were a perfect pair, really.